With the heat of the summer, I thought it would be nice to remember that it is not always this hot in California. Here is a hike from this Spring in Yosemite. I hope you enjoy it. I know I did! Although the weather during our visit Easter weekend of 2008, did not produce the snowfall I had hoped, it did provide the next best thing: a series of perfect spring days! Small patches of snow still could still be found in shaded locations on the valley floor and there was plenty higher up. Since I had never been on snowshoes before, I decided to do a little test drive on Friday. Two-mile Ranger guided snowshoe hikes are offered daily at the Badger Pass Ranger station. The tour was free ($5 donation requested) and included the snowshoes! 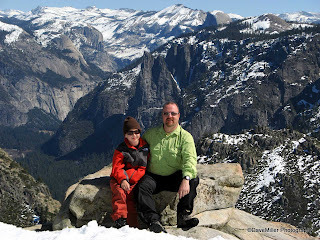 I talked my kids to giving it a try and We hiked on 4 ft of hard packed snow up Old Glacier Point Road to the original Badger Pass ski runs where we were treated to great views of the crest of the Sierra Nevada Mountains and the back side of Half Dome (looks like a full dome from the back)! With a couple miles on my new RedFeather snowshoes, I knew that I'd be able to handle Sunday’s hike to Dewey Point. On Saturday, I left the snowshoes in my car and with camera in hand headed into Yosemite Valley. I have been to Yosemite many times in the late spring and summer and expect the crowds, sometimes oppressive; however, I didn't expect the crush of people in the early spring. Maybe it was the beautiful weather, but most likely it was the Majesty of the park that beckoned everyone there. It didn't matter though; I got what I came for and more. Stunning vistas of the valley from Tunnel View; a prismatic Bridal Veil Falls glistening in the afternoon sun; an ice dome at the bottom of Upper Yosemite Falls and the grandeur of El Capitan dissipated the crowds from my mind. Early Easter morning, with the valley images fresh in my mind, my hiking buddy Tim, son Ronald and I headed back to Badger Pass to put on the snowshoes and take in the sites of Dewey Point. On the road ahead I saw something; it was just a glimpse, a coyote, in his full winter camouflage. He stopped and glanced at me; the type of glance wildlife gives i ntruders and darted off and was gone. It was just a second of my life, but enough for me to realize the day ahead was going to be special. It was cold at the trailhead, but what you would expect being surrounded by snow, pines, and firs. We geared up and with GPS in hand and the trailhead waypoint marked, began our trek on Glacier Point Road. You couldn't tell it was a road, there were machine groomed Nordic trails embedded in the snow. As we hiked, the only sound you could hear was the crunching of the snowshoes on the crusty trail. After about a mile, we left Glacier Point Road for Trail 18. The sign warned us: easier first mile, most difficult last 1.5 mile. No problem, we were ready for it. The trail marked by reflectors in the trees, guided us to a vast meadow. At the end of the meadow we picked up the narrow trail and now had the most difficult part left. The trail wound around the Red Firs and Lodge Pole Pines and gained and lost small amounts of elevation. I would not have called it difficult in the hard packed snow. It would have been more challenging had I been using cross country skis or in heavy powder. In no time at all we reached the point and were rewarded! I was in awe with the view. I had already experienced similar views of Yosemite Valley from Glacier Point, Sentinel Dome and Taft Point, but this was different. Maybe because we were closer to the valley entrance; maybe it was the solitude. I did my best to drain my camera’s battery. It was just the three of us at the point; such a stark contrast to the day before when I could feel the crush of the crowds on the valley floor. It was as if we had the whole of Yosemite to ourselves. We pulled out the JetBoil for some SanteFe Chicken and gazed at El Capitan just across the way, Cathedral Rocks below us and the rest of the valley beyond. After about a half hour of bliss, I heard sounds of others approaching, I glanced at them like the coyote did to me, not too happy with the intrusion. Within ten minutes, we packed up our stuff and we were gone. Checkout this hike and the GPS route at BACKPACKER magazine. Thanks for the comments. Setting up the blog was easier than I thought. Good Luck. African Safari in the Bay Area?